Former freelance journalist Patrick Daniel gathered his first experiences in the music business in a smaller booking agency. 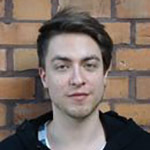 He then started to work for Snowhite, a recent German label, PR, management and music consultancy agency in Berlin. Snowhite works currently with bands from the US, UK, Belgium, France, Luxembourg, Finland, Norway, Denmark, Sweden, Switzerland, Austria and Germany.